Derek was born on December 22nd, 1976 in Kansas City, Missouri, he is currently 41 years old. He's 6'8'' tall and weighs in at 222 lbs. He graduated from Central HighSchool in Kansas City, Missouri. His pre-draft team Was Arkansas Sr. He was drafted into the National Basketball Association in 1999, and was in theNational Basketball Association for 5 years. 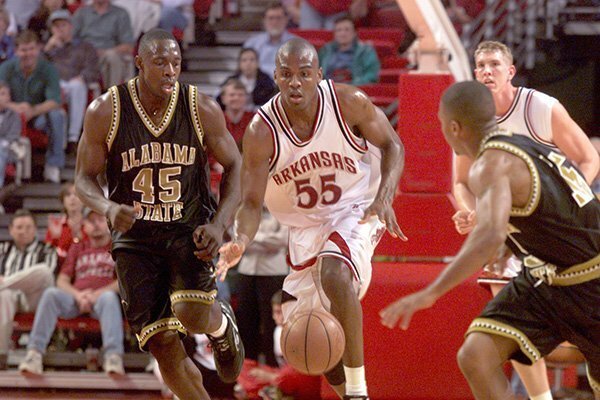 On June 30th 1990, Derek Hood was an unrestricted free agent after he went undrafted in the 1999 NBA Draft. It wasn't until October 4th 1999 that he signed a contract with the Hornets, it was a little over a month later on November 23rd 1999 that the Hornets placed his contract on waivers. On November 29th 1999 he became a free agent. A little over a year after he became a free agent Derek signed a contract with the sixers. On October 26th 2000 the sixers placed his contract on waivers, it was 4 days later he was a free agent. On September 28th 2001 he signed another contract, this time with the Suns. On October 20th 2001, the Suns placed his contract on waivers. He became a free agent on October 24th 2001. On September 30th 2002 Derek signed a contract with the Dallas. His contract was placed on Waiver by the Dallas on October 25th 2002. By October 29th 2002 he was a free agents. On October 5th 2004 he signed another contract with the Dallas. His contract was than placed on waivers by the Dallas on October 29th 2004. By November 2nd 2004 he was again made a free agent. To know more info click on Derek Hood Basketball.